Marking the end of the mega-wall, Moalboal Bay marks a sharp departure from a typical dive site in Moalboal, for instead of steep walls it features a shallow sandy area. 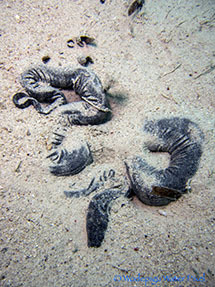 The marine life contained within Moalboal Bay is also markedly different from those on the wall. This is where you can find marine creatures like Pegasus fish, leaf pipefish, stargazers, dragonets and most uniquely, a resident dog-faced water snake that loves to take a nap in the area. Moaboal Bay livens up at night if one has the opportunity to arrange a night dive there. Juvenile bobtail squid love to hang out among the dead coconut leaves, and the once lethargic dog-faced water snake starts to hunt. A great site for long dives with a maximum depth of seven meters, one has time to observe cowry shells as they slowly dig their way into the sand - a pretty interesting sight to see. 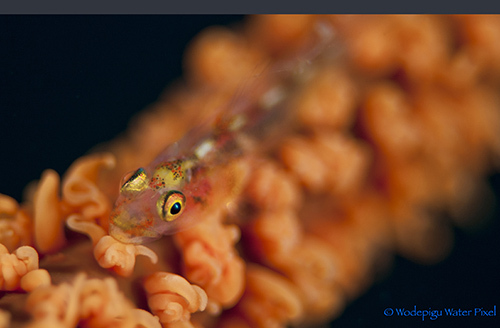 Urchin Clingfish. Taken with 2 Sea & Sea YS-D1 at ISO200. Manual mode at f22 and 1/320s. Tamron 60mm. Photo left: Dog Faced Sea Snake. Taken with 1 Sea & Sea YS-110a at ISO80. Manual mode at f8 and 1/250s. Photo right: Blenny. Taken with 1 Sea & Sea YS-110a at ISO80. Manual mode at f8 and 1/250s. Dyron +7 Diopter. 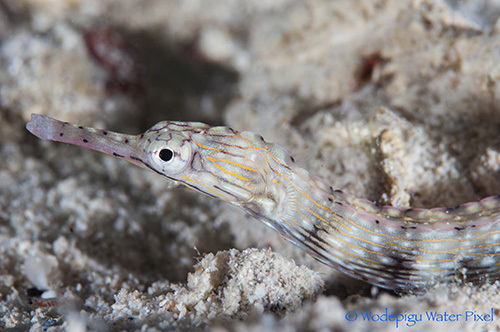 Network Pipefish. Taken with 2 Sea & Sea YS-D1 at ISO200. Manual mode at f22 and 1/320s. Tamron 60mm. 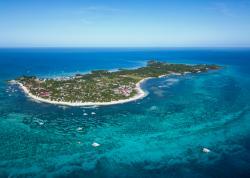 Three kilometers west of Panagsama Beach lies Pescador Island, the jewel of Moalboal diving and considered one of the best dive sites in the Philippines. With a landmass big enough to warrant a lighthouse, Pescador Island resembles a vertical rod and plunges down to depths of seventy meters. It gained further prominence a few years ago when a large school of sardines decided to make Pescador their home. With estimates as high as nine hundred thousand sardines, this sardine ball started attracting pelagic fish to hunt them around the clock. It even caught the attention of thresher sharks who would dart in and out of the bait ball energetically hunting - a contrast to their relative calm when seen gliding around Monad Shoal further north in Malapascua. This mini “sardine run” proved very popular in Moalboal and earned Pescador a name in the dive community. The hype of the mini “sardine run” proved to be a distraction from the great diving at Pescador Island. After all, there was a good reason the sardines showed up in the first place. Situated perfectly to catch the currents of the Tanon Strait, Pescador was always going to welcome wary marine travelers making a pit stop, as evidenced by frequent sightings of whale sharks and manta rays. The currents also bring with it the nutrients needed to support life, from plankton to the large pelagics. 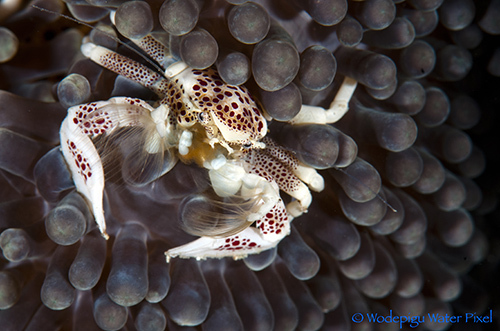 Porcelain Crab. Taken with 2 Sea & Sea YS-D1 at ISO80. Manual mode at f22 and 1/320s. Nikon 105mm VR. Photo left: Starfish Couple. Taken with 2 Sea & Sea YS-D1 at ISO80. Manual mode at f10 and 1/320s. Tokina 10-17 Fisheye. 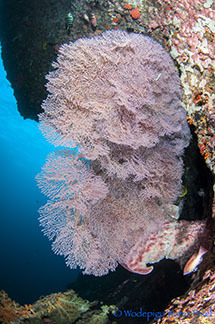 Photo right: Mega Sea Fan. Taken with 2 Sea & Sea YS-D1 at ISO80. Manual mode at f11 and 1/160s. Tokina 10-17 Fisheye. Every dive on Pescador aims to explore its sheer vertical dropoffs, and the life found on its walls does not disappoint. Hundreds of Anthias accompany you every step of the way, while schools of fusiliers and snappers can be seen on any part of the dive. 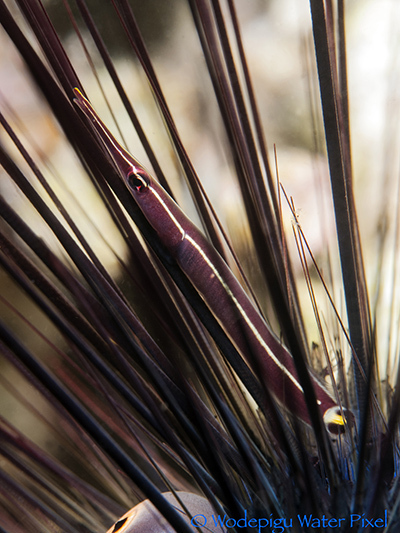 Pescador supports a very healthy population of lionfish; with Sergeant fish lurking around whip corals as they stand guard by their nests. Survivors of the last El Nino stand proud from the walls, with huge gorgonian fans still prominent features of the landscape. 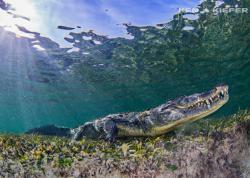 Pescador is mainly a playground for wide-angle enthusiasts, but plenty of macro life can also be found. 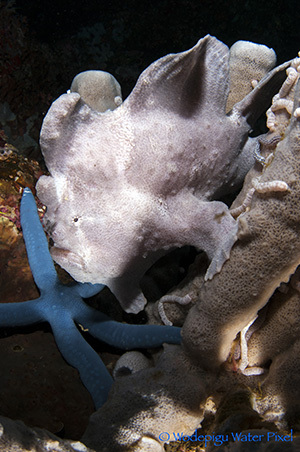 Frogfish are seen often, and there are 2 large pale purple ones that have made Pescador their permanent home – always perching themselves on the same sponge corals. Nudibranchs emerge from the crevices from time to time, and skeleton shrimp have recently been found. 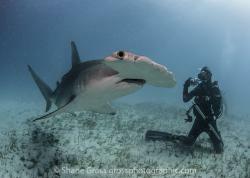 The more adventurous can opt to go deeper to seek out the schools of Jacks and white tip reef sharks that lurk there. Huge pairs of trevally have been seen divers logging enough time in the water are likely to spot the resident two-meter long giant barracuda. Elvis is In the Building. Taken with 2 Sea & Sea YS-D1 at ISO80. Manual mode at f13 and 1/100s. Tokina 10-17 Fisheye. 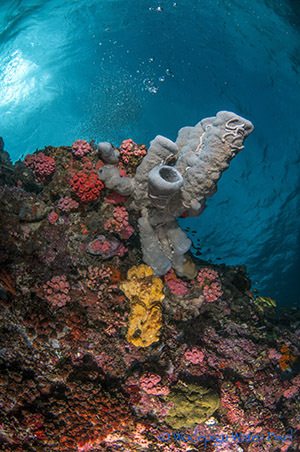 Being a pioneer dive destination in the Philippines also means being the first to discover and face environmental issues that are pertinent to the survival of the local scuba industry. 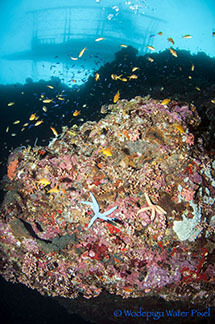 The resulting underwater environment degradation (either scuba-related or by inadequate fishing practices) led to an alliance between dive centers and the local government to better manage marine resources. The Moalboal Dive Center Association (MDCA) was set up with the auspices of the Municipality of Moalboal to manage the marine sanctuaries set up at Savedra, Basidot, Tuble and Pescador, which essentially covers all the dive sites in Moalboal, and charges divers a fee to dive its waters. Proceeds from the entrance fees are used to finance a range of initiatives, including setting up patrols to enforce the ban on destructive fishing practices and marine conservation education programs for the locals. Whale sharks have also become a common site at Oslob, just a ninety-minute drive from Moalboal (compared the three hours from Cebu City). Hundreds of people flock to the beaches of Oslob to see these gentle giants and many tour operators have sprung up. However, there is a distinct difference between other places in the Philippines like Donsol or Sogod Bay who also feature whale shark tours: In Oslob the locals keep the whale sharks close to shore by feeding them everyday. Nobody moves from a guaranteed food source, so these juvenile whale sharks happily stayed. As a result, marine conservationists are protesting against such an unnatural practice and I had a chance to see its effects for myself. Klemens Gann, who was the lead videographer engaged by Philippine national television to film a segment when this issue was still in its infancy sums it best: “When we first came to film them they were swimming around in a natural horizontal attitude. Now these whale sharks mainly adopt a vertical position to get food - they are like dogs.” I agree with him. Moalboal has been on the Philippine diving map as long as most of us can remember, and continues to provide an underwater world teeming with life. 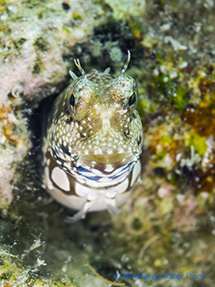 The easygoing vibe and lifestyle, combined with all the conveniences of modern life convinces divers to return year after year, and I have met divers who have been going back for fifteen years or more. The effects of shark fishing are keenly felt here, but pelagic fish still ply these waters and its walls are still full of dramatic reefscapes and amazing macro subjects. The Tanon Strait is deep and currents are strong, so you never know what the next tide brings.